Please join us for an interactive workshop on “Japanese Tea Ceremony – How Japanese Aesthetics Differs from the West”. What are the differences in way of thinking between the Japanese and the Westerners, and possibly other Asians? In this workshop Tea Master Soju Nakazawa will perform a tea ceremony in order for you to feel and think how different Japanese aesthetics are. 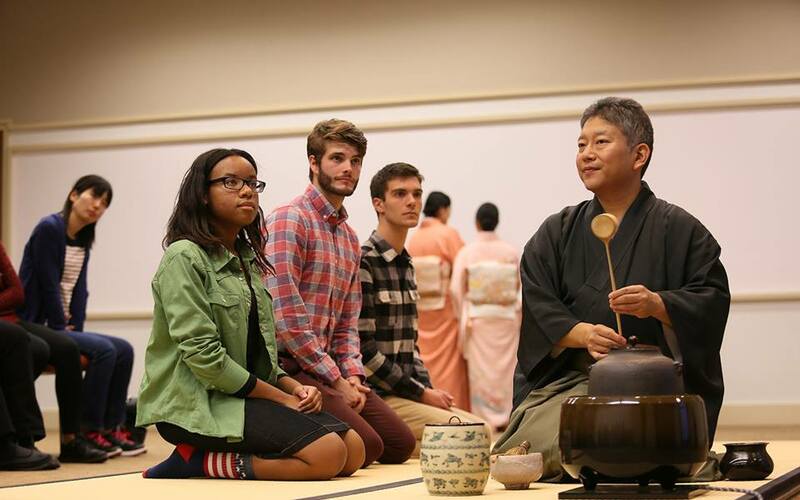 With the performance and lecture by the Tea Master, you will learn the basics of Japanese Tea Ceremony. Let’s also enjoy group discussions about the topic. The session will be conducted mostly in English with some Japanese explanation of the terms of Japanese Tea Ceremony. Tea Master Soju Nakazawa has been teaching the Japanese Tea Ceremony at schools and public/private organizations around the world including USA, Italy, Spain and France. Having grown up surrounded by Japanese traditional culture, especially by the tea culture, Mr.Nakazawa became an aficionado of the Japanese Tea Ceremony in his childhood long before becoming a master. His mother and grandmother are also tea masters; and Gonjuro Kawarazaki III (a famous Kabuki actor) and Tokuho Azuma (a grand master of Japanese classical dance) are his relatives.